For more than 30 years,Masterbuiilt has been designing quality indoor and outdoor cooking equipment that is simple to use. 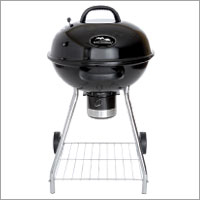 The Masterbuilt 22.5" Kettle Grill is equipped with a large cooking area, chrome-coated cooking grate, and striking black porcelain-coated lid. Also included is a bowl and ash can with Bakelite handle, chrome-coated legs and bottom shelf. 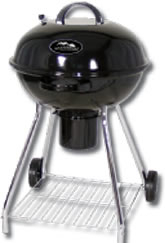 The heavy-gauge charcoal rack, adjustable air damper and built-in lid hanger will make you a grill master in no time.